If you don’t know already, I’m a religious reader of Angryasianman.com. AAM is my go to blog for any updates in the Asian American communities such as issues or events that take place across the nation and in the world. A few weeks ago, AAM shared a post about a documentary on Chinese babies who were adopted by Americans. I went to the film’s website, read about it, and saw a trailer, and thought to myself, “I have to see this!” I was always curious about the adoption process and how kids would grow up without knowing their biological parents. I was also excited to watch this because the director was going to be there to do a Q&A session after the film. Before watching the film, we went to this restaurant called: Cafe Dahab. I guess this restaurant is known for their shwarmas. So we decided to try some middle eastern food. 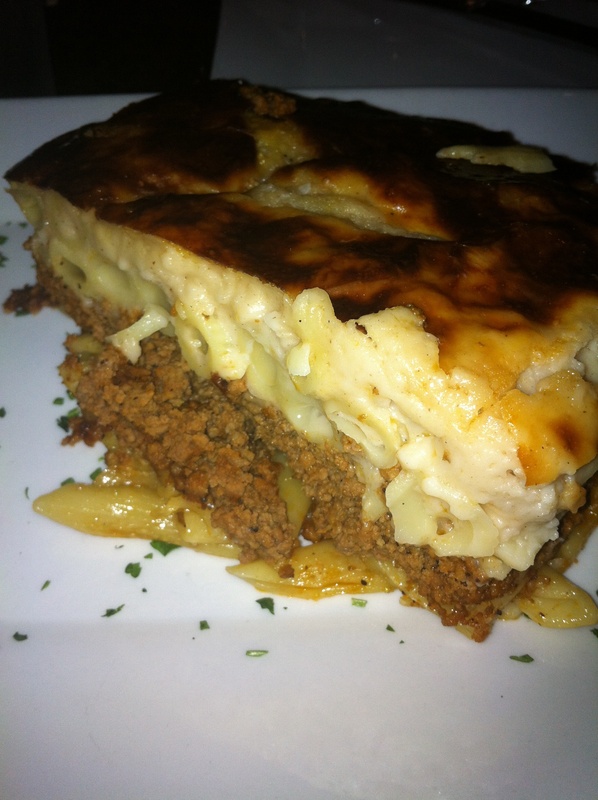 I ended up getting an Egyptian Lasagna which was surprisingly good. From the top it had a thin layer of cheese, then some thick kind of cream sauce which was really good, ground beef, and then pasta. It was one thick lasagna with various textures and flavors. I would recommend this to anyone though it may not seem very middle eastern. The only downside of this was that it was pricey for me, $14. The entrees there were overall a tad bit pricey for my taste. They ranged from $14-18. My friends got shwarmas, shish-ga-bob, and we all shared some really good hummus. I thought the hummus was a good pick as an appetizer. FYI: Yelp gave them 3.5 stars. If I’m in that area again, I would want to try Zanoukas which was a block or two away from theater. We weren’t able to walk over there because we were in a time crunch. I heard it’s a popular place to eat. After eating, we quickly walked over to the theatre that was a few doors down. I wasn’t expecting to cry at all but only to gain a perspective and knowledge of the adoption process and the people involved. I basically just wanted to learn. I ended up learning and bawling at the same time. This documentary was so much more than I expected. 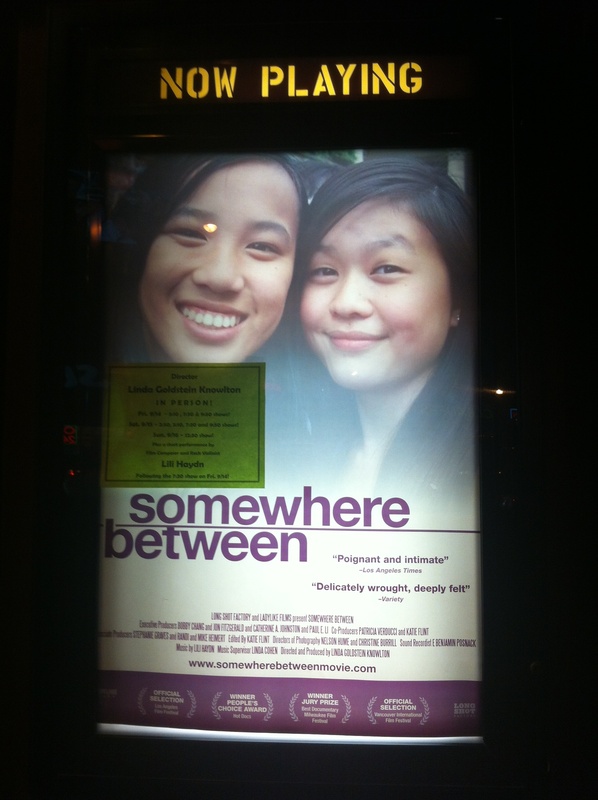 In the film, you meet several young Chinese-American girls who were adopted by Americans. Each one of them handles their past of being “abandoned” differently. One is content with life and doesn’t care to search for her biological parents. Another is eager to find her biological parents. In the film, you learn about each one’s journey of being adopted and growing up in America. In China, there is the one child rule which is basically one child per family. Parents in China focused and still focuses on primarily having a son in order to continue the family tree. Not for Jenna. Jenna who was one of the girls in the documentary got me really emotional. She felt that because she was a girl, her parents did not want her. WIth that, she felt that she had to prove herself in school and in extra curricular activities that she can succeed. As a student and daughter, she has always been hard on herself for the fact that she has to prove her past wrong. Therefore, she grew up being a perfectionist. As she was sharing that, I was able to sympathize the pain she felt for being “abandoned”. Personally, Jenna’s story hit me a lot but there was Haley’s story. Haley was curious about finding her biological parents. Her adoptive parents were supportive in her search. I won’t share with you whether or not she finds her parents in China that is populated with a billion people. I don’t want to spoil it because I want to encourage you to watch it if the film is available near you. When the DVD comes out next year, definitely take the time rent it and watch it. It is one moving film. At the end of the film, I felt as if I had been adopted! The documentary expressed the adoptees’ emotions deeply that I felt as if I were right there with them. Again, check out the film if you get the chance. Thank you, Angry Asian Man!